I wrote about Sara Forte's last book, her first book, right after my grandmother passed away. That sounds a morbid opening, but I don't mean it to be. In truth, the association offers its own kind of comfort. Sara's food is very much a means of taking good care of yourself, and a means to do so for those you love. My association of welcome and Sara is indelible, and I think that may be the same for a lot of you, too. Sara's new book with photography by her husband Hugh, Sprouted Kitchen Bowl and Spoon, is just memorable as that first, and once again arrived at a time when my grandmother was on my mind. With my own book coming out in 12 days (12 days!!) the reality has settled in. It has landed on my shoulders not as weight, but as something else, like the static shocks you get from rubbing your feet on the carpet. It feels like a current buzzing between my shoulder blades. And, with each day closer, I wonder more and more often about what my grandmother would think of the book. Gigi had a tendency to grant praise partnered with just enough criticism that the compliment didn't go to your head. While it may have come across as feisty, or perhaps sharp of her to say so, the critique kept things in perspective. And, there was the added value of that. Once, upon reading an article I'd written, she told it was very good, but maybe too serious. It would benefit from a joke. Preferably a dirty one. In my view, Sara's book, and her work in general, offers both deliciousness and perspective in balance. Interwoven with her inventive combinations of texture and taste is subtle encouragement and simple advice on making sensible, responsible choices for our health and environment. Beauty and flavour are not sacrificed in her commitment to whole food and eating healthfully, but rather highlighted by it, as she creates meals without anything to get in the way of the natural gorgeousness of her ingredients. Bowl and Spoon is the perfect companion to Sara's first book, and very much the extension of what she started there. It's Sara through-and-through, which may be all I need to say. There's more! Penguin Random House of Canada has posted their own preview, with not only except of some of the book's text, but also my Bee Stung Fried Chicken with Korean gochujang honey to finish, and my method for Avocado Toast. Take a look, here. Also, I've started adding events to the News + Events section on the top bar. There will be more there soon! Finally, for I truly appreciate all the feedback on what sort of information you'd hope to see in regards to writing a book, and how the opportunity came about for me. I'm working on the posts, and so keep any such suggestions coming! Until then, Heidi shared the most beautiful look at her proposal process, and it is truly inspiring. That's it for now. I want to pop in once more before the book comes out, so I'll see you then. "This started as a Bon Appétit recipe that got repurposed for the blog, and now has made its way into bowl format for this book. 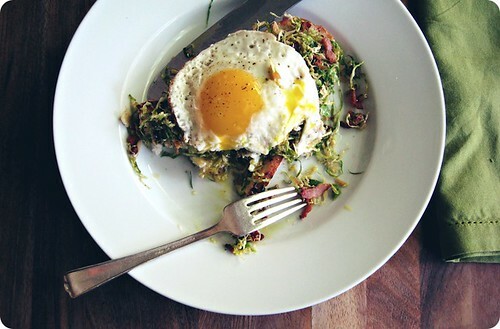 I am always looking for everyday breakfast that can be put together relatively quickly, especially with eggs. I bake these in small shallow baking dishes, but a large ramekin or cast-iron pan works great as well. I assume two eggs per person and serve it with fruit and toast for dipping in the yolks. 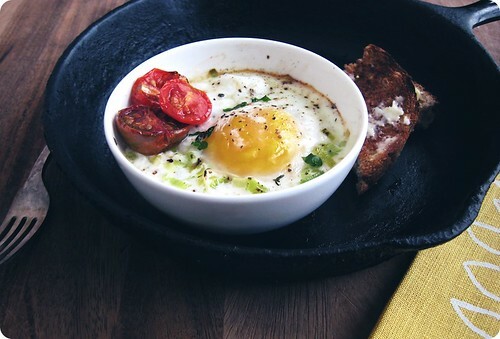 The French, who more beautifully call baked eggs oafs en cocotte, often use a bain-marie for ideal egg texture, but I find the following approach just as suitable. " Preheat the oven to 400°F and set a rack in the upper third. Wipe the insides of four gratin dishes or large ramekins with butter and set on a baking sheet. In a small bowl, mix together the coarse ground mustard, 1 tablespoon of the Dijon mustard, the olive oil, and salt. Add the bread crumbs and toss to coat. Spread the on a baking sheet and bake for 10 to 12 minutes, until crispy. Set the bread crumbs aside, but leave the oven on. In a large skillet over medium heat, add just enough water to cover the bottom; add the greens. Toss until wilted down, 2 to 3 minutes. Transfer to a strainer and press out the excess liquid. You should have about 2 heaping cups greens. Wipe out the skillet and melt the butter over medium heat. Add the shallot and sauté until translucent, about 1 minutes. Add the greens, the remaining tablespoon of Dijon mustard, the cream, and a pinch of salt and pepper. Stir until warmed through and just thickened, about 3 minutes. Divide the greens between the prepared dishes and bake on the sheet in the upper third of the oven for 8 minutes. Remove sheet and carefully break two eggs onto the greens in each dish. Sprinkle the tops with a pinch of pepper and a few tablespoons of the Gruyère and bake for 6 minutes, until the whites are just cooked but the yolks still runny. Let them sit for a minute to settle. Garnish with the bread crumbs, thyme, and parsley. The well-prepared cook I am, I was out of parsley and thyme, so had to leave them off. I added dried chile flakes for some extra colour and because I have an addiction to spice with eggs and cheese. If I had shown you the collected plates of our last week or so, it would have made for the most boring slideshow in the history of the world. It's been pretty much one word, four syllables, at almost every meal. Asparagus. Daily. There's been no complaints. There it's been, with oozy-yolked dipper eggs to start the day, shaved into emerald-edged ribbons as a lunch salad, stir-fried with ginger, sesame and soy for dinner. When baking a cake left me with egg yolks left over, I took it as a sign and lickety-split made a herb-specked, lemon-heavy Hollandaise to drag our stalks through. I was tempted to tell you the way I've liked it best, but it's not much of a recipe. Just a knob of butter melted in a heavy skillet and allowed to begin to brown, then stopped from going overboard by a scant pour of olive oil. In goes trimmed asparagus and another scant pour - water this time - quickly simmering/steaming the stalks to tender-crisp and setting their colour at its brightest. 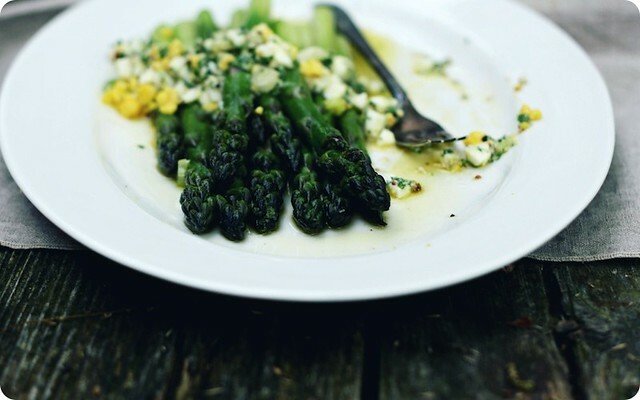 Once the water's bubbled away, the asparagus goes off the heat and onto a plate. There's salt and pepper to finish, along with a squeeze of lemon, an extra drop of oil and broad, lacy shavings of Parmesan. No trick to that. And so instead, I thought I'd tell you about a dish that has a bit more going on but shares the same quick time from counter to table. It may not be my full-stop favourite, but it's up there and gaining a following. It starts with a winner of a sauce - David Lebovitz's sauce gribiche. Like he says, it's one of those keep-it-in-your-back-pocket recipes that makes something kind of spectacular out of a few everyday ingredients. It's French in lineage, a loose sauce-meets-vinaigrette, with an emulsification of (cooked!) egg yolk and mustard to start, a good measure of olive oil, chopped egg, capers, cornichons and herbs. That was where I was heading. Then, thumbing through Canal House Cooking Volume No. 3 - the winter and spring edition from last year - I was reminded of their take on the iceberg wedge; sharp, crunchy radicchio garnished with hard-boiled eggs, scallion and crisp pancetta. It's gorgeous. Their vinaigrette and garnish shares a lot of qualities with sauce gribiche, and that's when I decided to change course and take the best from both. This vinaigrette ends up eggier than his sauce gribiche, and the cornichons are swapped out for the fresh pungency of scallion - that's the Canal House influence at work. My only original contribution was to fleck the dressing with dried red pepper flakes, which spark here and there. We ate it at lunch yesterday with nothing else necessary than a slice of toasted granary bread as raft for the spears. The crumb opened up to the spiky, supple dressing, and the crust afforded the dish substantial chew. Use the last of your bread for sopping up all the extra bits and dregs of dressing - be greedy with the bread, I say. One note on the asparagus itself; you can prepare it however you prefer, but can we talk about matters of size? Go straight for the thicker stalks, the kind that almost require a fork and knife when eating with anyone aside from the closest of company. Dainty, they are not, those sturdy ones. The fat, juicy stalks really have the most flavour, and it's their fleshy sweetness that stands up to the piquancy of this dressing best. If those spindly stems we often see are thought of as pencil-thin, the sort you'll want here are more the magic-marker variety. As with a traditional sauce gribiche, this vinaigrette would be happy to pal around with some boiled new potatoes or a nice bit of fish. Or, to tweak the Canal House example, I'd like it this over grilled wedges of radicchio at the next barbeque. I've got ideas of blanched green beans when they're around. That said, I've not tried any of those suggestions. We've only gone so far as asparagus and stopped quite stubbornly there. For right now, in this asparagus season that is so quickly passing, that's far enough for me. Adapted from from Canal House Cooking and David Lebovitz, with thanks. In a small bowl, pinch together 1/8 teaspoon salt with the white part of the sliced scallions. Once the scallion begins to release some juice, stir in the red wine vinegar and set aside. Separate the egg yolks from the hard boiled eggs. Place one egg yolk in a medium bowl. Chop the other egg yolk and egg whites separately, and keep both aside for later. Mix the Dijon mustard into whole egg yolk until smooth. Using the back of a spoon or fork, beat in 1/3 cup of the olive oil in a thin, steady stream. Once emulsified, stir in the vinegar and white scallions. Add the reserved egg whites to the sauce, along with the capers, the chili flakes and most of the parsley. Taste and season with salt and pepper as needed. It'll be quite kicky. If the sauce seems too thick, loosen with the extra olive oil. 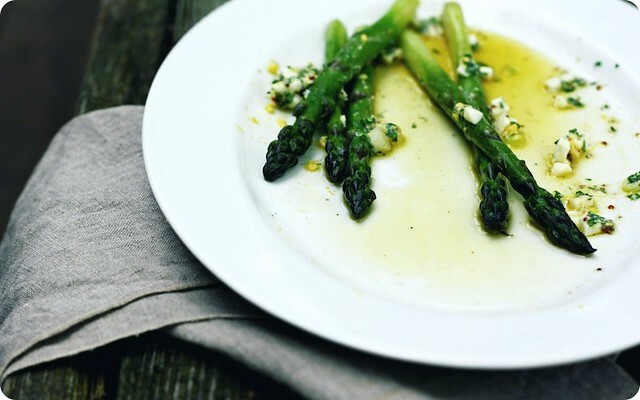 To serve, arrange the cooked asparagus on a plate. Spoon over the sauce, then garnish with the chopped egg yolk, reserved parsley and scallion greens. It just so happens that two people, especially important people to me, are far away right now. One will be back soon enough, soon I'll be able to count down to their arrival on the fingers to one hand. But the other, well, for her return I would have to count all my fingers and my all toes many times over before the day comes that I can give her a proper hug. That return feels every bit as far away as it is. In the meantime, I'm keeping the wistful glances at the calendar at minimum by keeping occupied with the imagined agendas of that homecoming. I'm squirreling anecdotes and stories away in the back of my mind, ready and witty, for the conversations that we'll have. This dearest friend is also with me in the kitchen, or at least her influence was, when I was making this baked ricotta today. Light but with a gentle creaminess, dotted with pretty green bits of herbs and zingy with lemon, it reminds me of so many meals we've shared over the years of our friendship. On a plate between us, a meal that doesn't mind if it's forgotten when the gossip gets really good. You'll know this is for you when you read it, so I promise that when you're home I'll make it for you - don't worry, I'll leave out the chili. We'll eat it with garlic-scrubbed shingles of grilled bread, drink something sparkling and catch up. It will be the best time. Keep safe until then. Hugs to you. I am simply without the words to express my feelings for those who won't be coming home after the devastating earthquake in Haiti. My heart breaks for those left behind. If you are able, please consider giving to aid organizations working to help rebuild. Yele Haiti, Médecins Sans Frontières , UNICEF and CARE and are just some of the many organizations working tirelessly on behalf of those who need it most right now. Julie is also spearheading a project to bring together food bloggers to raise funds; I'll share more details as they come, but read the announcement of Blog Aid here. The Canadian government has committed to matching Canadian donations, dollar for dollar, towards the relief effort and I hope we take full advantage of their promise. Hello my dears, will you do me a favour? Preheat your oven to 400°F. While you're at it, start slicing some leeks while we catch up. I was feeling pretty good about my preparedness for the coming holiday season this whole year-end business, that is, I was until a friend sweetly pointed out that as of today, there were a mere six days left until our merriment begins. How'd that happen? Their math must be wrong. Let's see, 24-18 equals ... oh. Shoot. No such luck. We're almost at the count-the-days-on-one-hand stage, people. Before I go on, how are those leeks coming? All sliced? Take a second and put a skillet on to heat with a knob of butter in there. When that's melted, toss in your leeks and stir them around so that everybody's friendly. Where was I? Yes, there's a lot going on. I'm particularly giddy to report that Menu for Hope is off to a rip-roaring start. We've just hit the $20,000 mark, with fingers crossed that the momentum continues through the second half of the campaign. And we've got some happenings that should help in the momentum department, first off let me extend my thanks and welcome to the kind folks at EAT Magazine, who have donated another raffle item to our efforts. "Taste of British Columbia" brings together a variety of offerings from producers from this gorgeous province, including Untamed Feast’s delicious dried wild mushroom products (Forest Blend), locally grown roasted hazelnuts from Butler Hazelnut Farm, Vista d’Oro Farm’s Turkish Fig with Walnut Wine, a ½ lb. bag of Mile 0 Roasters Niagara Blend, Gathering Place’s Organic Rooibos Tea, and two chocolate bars from organicfair. To bid on their item, enter code CA12, when donating. There are lots of new raffle items being added every day; be sure to keep checking the worldwide listing for the most up-to-date information. Speaking of donations, we've got a brand spankin' new donation form for you; it lists all raffle items available worldwide, with a simple widget alongside that tallies your bids. To see it in all it's point-n-click glory, click here. Oh! Back to the leeks. How are they doing? Are they all loopy and lithe yet? No? Okay, we've got a few more minutes to go. More news. Remember way back in June when I said I'd be in the summer issue of UPPERCASE magazine? Well, Janine was kind enough to extend the invitation for me to write for them again. I'll be in the Winter issue, out in January 2010, talking about Maple Walnut Caramel. It's the recipe that started my recent walnut fixation. While we're on the subject of UPPERCASE, a first look at the cover for the issue was recently available for subscribers to their newsletter. I'm sort of in love with it. I think you will be too. The leeks should be looking about there by now - give them a poke with your spoon. They should be soft and sweet, still green and brightly fragrant. Good stuff, we're ready to go. Now this is probably only exciting to me, but I've finally settled on what I'm making for the savoury portion of our Christmas breakfast. As you might have surmised, those scrummy leeks play a big part in the deliciousness to come this December 25th's a.m. I have been looking for a partner to the Breakfast Bread from Donna Hay from years ago. A steadfast presence our menu that's focaccia in feel, but with a biscuit method for the base. A thick, spongy dough lays beneath a Christmassy landscape of wilted spinach and oven-dried tomatoes, with a crowning snowdrift of Gruyère to cover all. This is a bread that I start thinking about in the fall, when the last of the tomatoes are coming off the vine and I'm drying and preserving them in oil in eager anticipation of their winter debut. Whatever arrives alongside that bread has to be a humdinger of a dish. Enter the wonderful Lusia Weiss, with exactly what I was looking for. The Baked Eggs in Cream she introduced last week are, as she says, adorable. And boy are they tasty. From the softly-set egg that is lush and dreamy, to the supple leeks hiding underneath the whiteness, it's ridiculously easy to get all swoony about this recipe. What's even more brilliant for my needs is that I can cook the leeks the night before, so they're ready and waiting come Christmas morn; crack an egg and spoon over some cream, in to the oven they go. En masse, everyone's taken care of. If I'm being honest, the presentation of the individual ramekins was of specific appeal. Not only does this recipe allow you to cook for many with minimal fuss, it also allows for some greedy indulgence. A fleet of these little darlings on the table looks abundant and generous, but to each is own means that nobody has to share. With all the support we've had for Menu for Hope, a moment of mine-all-mine gluttony can certainly be overlooked. You've all earned it. A multiplied rendition of Camino's original, via The Wednesday Chef. Luisa's advises cooking the leeks longer than in the original recipe, and I am not one to argue. 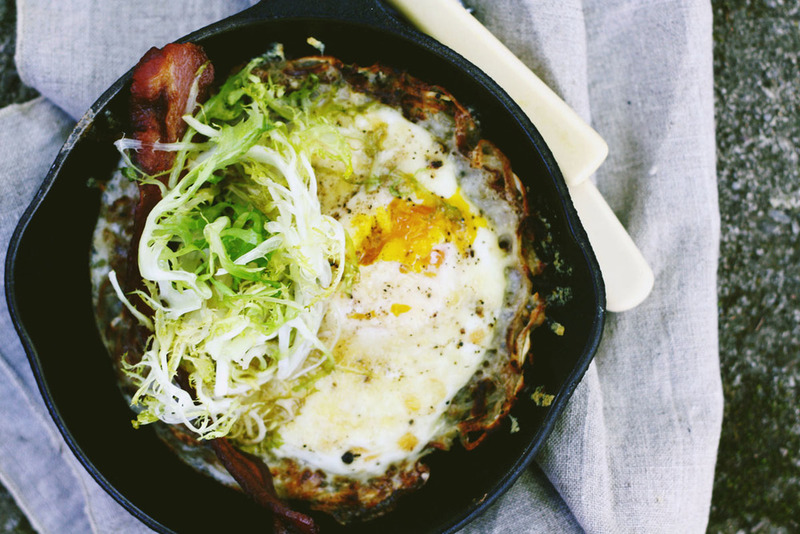 A cluster of oil-packed dried tomatoes nudged up against the yolk added an appreciated acidity. With a rack set in the middle, preheat oven to 400°F (200°C). In a small sauté pan over medium heat, melt the butter. Add the leeks, along with a splash of water and a pinch of salt. Cook until the leeks are tender, around 10 minutes. Stir in the herbs. Divide the herbed leeks among four small dishes or ramekins, flattening the vegetables out slightly to make a nest for the eggs. Crack one egg in the middle of each dish. Add enough cream to just over the white, then season with salt and the freshly-ground black pepper. Set the dishes on a baking sheet and bake in the oven until the white is set, between 8 to 12 minutes. 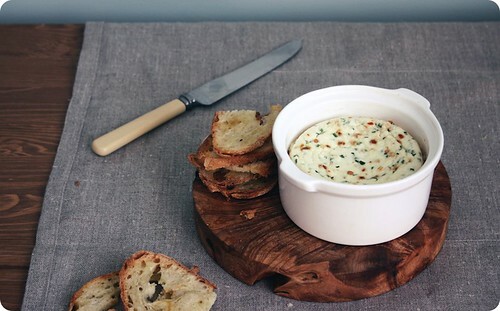 Serve immediately, with the grilled bread. Serves 4. Or really 2, as you'll want seconds. Trust. These Chocolate Almond Toffee Bars look innocent enough, but are two bites of true, gooey indulgence. Photos courtesy of Irene Powell. Even though one may not mean to become caught up in things, sometimes it is unavoidable. Such was my case recently, as a (thankfully-mild) strain of the chicken pox made its way through our little ones, forcing our household into a state of quarantine and oatmeal baths for two weeks. This was followed closely by an infection that had Mummy curled up on the couch, slippers on and blanket pulled up tight, for another few days. Suddenly almost a month has gone by, and it seems all in a blur. Now we are about ankle-deep in holiday preparations; events with family and friends are already scheduled, decorations are already being considered, and menu ideas are already floating around in my head. Where did this autumn go? It feels like Halloween was just yesterday. 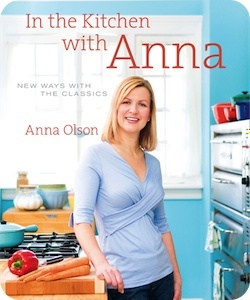 Lucky for us, I had the book In the Kitchen with Anna: New ways with the Classics standing by at the ready. In it, chef Anna Olson offers up meals and menus that have a nostalgic appeal; a bit retro, a bit kitch sometimes, but always tasty. This is feel-good eating at its best, and just the sort of food one craves when life gets a bit hectic. While the book does include entertaining-worthy recipes like unctuous Mushroom Potato Brie Tarts and an impressive Garlic Roasted Turkey Crown with Chardonnay Pan Sauce, it is the modern classics like the Contemporary Cobb Salad, Ultimate Cheese Fondue and Baja Fish Tacos, that are, in my mind, the real draw. Through the craziness over the last few weeks, I found myself turning to this book numerous times for inspiration. And rarely did it disappoint. I have pledged my allegiance to steel-cut oats, but I tried Olson's version using the rolled variety when I found my cupboard was bare of the former. Surprisingly light due to the addition of oat bran, the oatmeal was delicious. So good in fact, that when mornings dawned cold and grey, I reached for this breakfast again and again. The Rockwell Bake, a savoury bread pudding that combines all the flavours of Thanksgiving dinner, was hearty and soul-satisfying. Anna's Pot Roast was fairly-standard comfort fare, brightened through a second addition of vegetables towards the end of cooking. While good, however, what stole the show that night was the recommended accompaniment of Fluffy Dumplings. True to their title, these dumplings were pillowy-light, and an ideal way to sop up the roast's beer-soused gravy. For those visiting the Niagara Region, Olson's two specialty food shops sell dishes from In the Kitchen with Anna as some of their prepared foods. It is a wonderful opportunity to taste some of the food before purchasing the book and also a testament to Olson's confidence in standing behind these recipes - a true mark of quality. It was at her St. David's, Ontario, location that we were able to try the Beef, Caramelized Onion and Smoked Cheddar on Foccacia sandwich. Hot off of the panini press, the exterior was shatteringly crisp, giving way to melt-in-your-mouth slices of beef, accented by sweet onions, a slathering of grainy mustard and subtly-smoked cheese. Since Olson is famous for her desserts, far be it from me to ignore that chapter. The Lemon Cheesecake Mousse tarts had an beautifully light texture with the perfect sharp citrus note. They managed to be delicate but luscious, all at once. Dangerously-easy to make are the Chocolate Almond Toffee Bars (photographed above, please see recipe below); to call these rich would be a gross understatement. A sturdy crust of oats and graham is scattered with both toffee and chocolate, then almonds, and finally a blanketing of sweet condensed milk. This modest effort results in a bar cookie that is tender in its belly, but slightly burnished and crisp above. Ridiculously addicting stuff. Only one recipe fell short of expectation; the Artichoke Asiago Squares. The appetizer, somewhat akin to crustless quiche, is billed to taste like the popular dip of the same name and readers are urged "if there is no other recipe you make from this book, please make it this one." With such an introduction, these were a definite must-try. 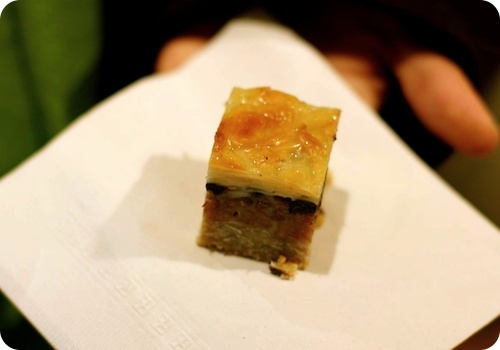 But while the squares are good, none of my tasters thought them great. The consensus was that they were best served warm, but even then the texture was not a favourite and some found the asiago could have been more pronounced. I would not call this a failure, but I would say that there are stronger dishes in the book. The book itself is bright and colourful. The food looks fresh, shot simply, but beautifully, by Ryan Szulc. Minimally styled by Olson, the images are homey and inviting, with little fuss marring our look at the the food. I particularly enjoyed how the recipes were laid out. Accompanying each was not only general notes included in the header, but also a three-part footnote outlining the taste, technique and tale of that particular dish. This additional information included more in-depth information about the ingredients or preparation, and also were a peek into the personality of Olson herself; the chatty, convivial tone was charming to read. From the every day to almost every celebration, for lazy weekends and when the weekdays are flying by, In the Kitchen with Anna: New Way with the Classics includes recipes that are excellent additions to any cook's repertoire. Showing us easy, accessible cooking with touches that make each dish feel special, Olson makes a lovely kitchen companion. Preheat the oven to 350°F (180°C). Grease and line an 8-inch (2 L) square pan with parchment paper so that the paper hangs over the sides of the pan. Stir the oats, graham crumbs and salt in a bowl to combine, then stir in the melted butter. Press the crumbly oat mixture into the prepared pan. Sprinkle Skor bits evenly on top, followed by chocolate chips and sliced almonds. Pour condensed milk evenly over pan (it will sink in as it bakes) and bake for 30 to 40 minutes, or until the top is golden brown and the edges are bubbling. Cool to room temperature in the pan, then chill for at least 4 hours before slicing into bars. Store toffee bars in the refrigerator for up to a week. This is decadence in a pan. 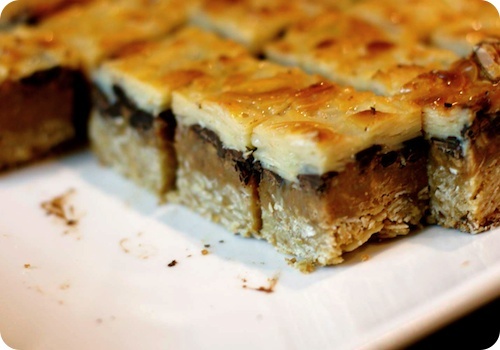 The sinful combination of chocolate, toffee and almonds enveloped in condensed milk that caramelizes as it bakes is irresistible. At least these have oats in them to redeem themselves, just a little bit. This is a simple recipe to execute—you gather the ingredients and layer them, basically. The challenge is in waiting for them after they've finished baking! My head pastry chef at Olson Foods + Bakery, Andrea, brought this recipe to my attention. She is an excellent baker, and we go way back. She started with me as a high school co-op student, while I was just picking up professional baking myself on the job, so we learned together. That was about 15 years ago, and after her stint at cooking school and gaining other work experience, I'm thrilled that we are working together again after all these years. Permission to print recipe and cover image courtesy Whitecap Books.